Variant of human Kunitz-type protease inhibitor domain II of tissue factor pathway inhibitor (TFPI), the variant comprising the following amino acid sequence X1 Asp Phe Cys Phe Leu Glu Glu Asp X?2 Gly X3 Cys X4 X5 X6 X7 X8 X9¿ Tyr Phe Tyr Asn Asn Gln Thr Lys Gln Cys Glu Arg Phe X10 Tyr Gly Gly Cys X?11 X12 X13¿ Met Asn Asn Phe X14 Thr Leu Glu Glu Cys Lys Asn Ile Cys Glu Asp X15 (SEQ ID No. 1), wherein X1 represents H or 1-5 naturally occurring amino acid residues except Cys, X2-X14 each independently represents a naturally occurring amino acid residue, and X15 represents OH or 1-5 naturally occurring amino acid residues except Cys, with the proviso that at least one of the amino acid residues X1-X15 is different from the corresponding amino acid residue of the native sequence. The present invention relates to a variant of a human Kunitz-type protease inhibitor domain, DNA encoding the variant, a method of producing the variant and a pharmaceutical composition containing the variant. Polymorphonuclear leukocytes (neutrophils or PMNs) and mononuclear phagocytes (monocytes) play an important part in tissue injury, infection, acute and chronic inflammation and wound healing. The cells migrate from the blood to the site of inflammation and, following appropriate stimulation, they release oxidant compounds (O2•, O2-, H2O2 and HOCl) as well as granules containing a variety of proteolytic enzymes. The secretory granules contain, i.a., alkaline phosphatase, metalloproteinases such as gelatinase and collagenase and serine proteases such as neutrophil elastase, cathepsin G and proteinase 3. Latent metalloproteinases are released together with tissue inhibitor of metalloproteinase (TIMP). The activation mechanism has not been fully elucidated, but it is likely that oxidation of thiol groups and/or proteolysis play a part in the process. Also, free metalloproteinase activity is dependent on inactivation of TIMP. In the azurophil granules of the leukocytes, the serine proteases neutrophil elastase, cathepsin G and proteinase-3 are packed as active enzymes complexed with glucosaminoglycans. These complexes are inactive but dissociate on secretion to release the active enzymes. To neutralise the protease activity, large amounts of the inhibitors α1-proteinase inhibitor (α1-PI) and α1-chymotrypsin inhibitor (α1-ChI) are found in plasma. However, the PMNs are able to inactivate the inhibitors locally. Thus, α1-PI which is the most important inhibitor of neutrophil elastase is sensitive to oxidation at the reactive centre (Met-358) by oxygen metabolites produced by triggered PMNs. This reduces the affinity of α1-PI for neutrophil elastase by approximately 2000 times. After local neutralisation of α1-PI, the elastase is able to degrade a number of inhibitors of other proteolytic enzymes. Elastase cleaves α1-ChI and thereby promotes cathepsin G activity. It also cleaves TIMP, resulting in tissue degradation by metalloproteinases. Furthermore, elastase cleaves antithrombin III and heparin cofactor II, and tissue factor pathway inhibitor (TFPI) which probably promotes clot formation. On the other hand, the ability of neutrophil elastase to degrade coagulation factors is assumed to have the opposite effect so that the total effect of elastase is unclear. The effect of neutrophil elastase on fibrinolysis is less ambiguous. Fibrinolytic activity increases when the elastase cleaves the plasminogen activator inhibitor and the α2 plasmin inhibitor. Besides, both of these inhibitors are oxidated and inactivated by O2 metabolites. PMNs contain large quantities of serine proteases, and about 200 mg of each of the leukocyte proteases are released daily to deal with invasive agents in the body. Acute inflammation leads to a many-fold increase in the amount of enzyme released. Under normal conditions, proteolysis is kept at an acceptably low level by large amounts of the inhibitors α1-PI, α1-ChI and α2 macroglobulin. There is some indication, however, that a number of chronic diseases is caused by pathological proteolysis due to overstimulation of the PMNs, for instance caused by autoimmune response, chronic infection, tobacco smoke or other irritants, etc. Aprotinin (bovine pancreatic trypsin inhibitor) is known to inhibit various serine proteases, including trypsin, chymotrypsin, plasmin and kallikrein, and is used therapeutically in the treatment of acute pancreatitis, various states of shock syndrome, hyperfibrinolytic haemorrhage and myocardial infarction (cf., for instance, J.E. Trapnell et al, Brit. J. Surg. 61, 1974, p. 177; J. McMichan et al., Circulatory shock 9, 1982, p. 107; L.M. Auer et al., Acta Neurochir. 49, 1979, p. 207; G. Sher, Am. J. Obstet. Gynecol. 129 , 1977, p. 164; and B. Schneider, Artzneim.-Forsch. 26, 1976, p. 1606). Administration of aprotinin in high doses significantly reduces blood loss in connection with cardiac surgery, including cardiopulmonary bypass operations (cf., for instance, B.P. Bidstrup et al., J. Thorac. Cardiovasc. Surg. 97, 1989, pp. 364-372; W. van Oeveren et al., Ann. Thorac. Surg. 44, 1987, pp. 640-645). It has previously been demonstrated (cf. H.R. Wenzel and H. Tschesche, Angew. Chem. Internat. Ed. 20, 1981, p. 295) that certain aprotinin analogues, e.g. aprotinin(1-58, Vall5) exhibits a relatively high selectivity for granulocyte elastase and an inhibitory effect on collagenase, aprotinin (1-58, Alal5) has a weak effect on elastase, while aprotinin (3-58, Arg15, Ala17, Ser42) exhibits an excellent plasma kallikrein inhibitory effect (cf. WO 89/10374). However, when administered in vivo, aprotinin has been found to have a nephrotoxic effect in rats, rabbits and dogs after repeated injections of relatively high doses of aprotinin (Bayer, Trasylol, Inhibitor of proteinase; E. Glaser et al. in "Verhandlungen der Deutschen Gesellschaft für Innere Medizin, 78. Kongress", Bergmann, München, 1972, pp. 1612-1614). The nephrotoxicity (i.a. appearing in the form of lesions) observed for aprotinin might be ascribed to the accumulation of aprotinin in the proximal tubulus cells of the kidneys as a result of the high positive net charge of aprotinin which causes it to be bound to the negatively charged surfaces of the tubuli.. This nephrotoxicity makes aprotinin less suitable for clinical purposes, in particular those requiring administration of large doses of the inhibitor (such as cardiopulmonary bypass operations). Besides, aprotinin is a bovine protein which may therefore contain one or more epitopes which may give rise to an undesirable immune response on administration of aprotinin to humans. It is therefore an object of the present invention to identify human protease inhibitors of the same type as aprotinin (i.e. Kunitz-type inhibitors) with a similar inhibitor profile or modified to exhibit a desired inhibitor profile. wherein X1 represents H or 1-5 naturally occurring amino acid residues except Cys, X2-X14 each independently represents a naturally occurring amino acid residue except Cys, and X15 represents OH or 1-5 naturally occurring amino acid residues except Cys, with the proviso that at least one of the amino acid residues X1-X15 is different from the corresponding amino acid residue of the native sequence. In the present context, the term "naturally occurring amino acid residue" is intended to indicate any one of the 20 commonly occurring amino acids, i.e. Ala, Val, Leu, Ile Pro, Phe, Trp, Met, Gly, Ser, Thr, Cys, Tyr, Asn, Gln, Asp, Glu, Lys, Arg and His. TFPI, also known as extrinsic pathway inhibitor (EPI) or lipoprotein associated coagulation inhibitor (LACI), has been isolated by Broze et al. (Proc. Natl. Acad. Sci. USA 84, 1987, pp. 1886-1890 and EP 300 988) and the gene coding for the protein has been cloned, cf. EP 318 451. Analysis of the secondary structure of the protein has shown that the protein has three Kunitz-type inhibitor domains, from amino acid 22 to amino acid 79 (I), from amino acid 93 to amino acid 150 (II) and from amino acid 185 to amino acid 242 (III). Kunitz-type domain I of TFPI has been shown to bind TF/FVIIa, while Kunitz-type domain II has been shown to bind to FXa (Girard et al., Nature 338, 1989, pp. 518-520). By substituting one or more amino acids in one or more of the positions indicated above, it may be possible to change the inhibitor profile of TFPI Kunitz-type domain II so that it preferentially inhibits neutrophil elastase, cathepsin G and/or proteinase-3. Furthermore, it may be possible to construct variants which specifically inhibit enzymes involved in coagulation or fibrinolysis (e.g. plasmin or plasma kallikrein) or the complement cascade. One advantage of TFPI Kunitz-type domain II is that it has a negative net charge as opposed to aprotinin which, as indicated above, has a strongly positive net charge. It is therefore possible to construct variants of the invention with a lower positive net charge than aprotinin, thereby reducing the risk of kidney damage on administration of large doses of the variants. Another advantage is that, contrary to aprotinin, it is a human protein (fragment) so that undesired immunological reactions on administration to humans are significantly reduced. 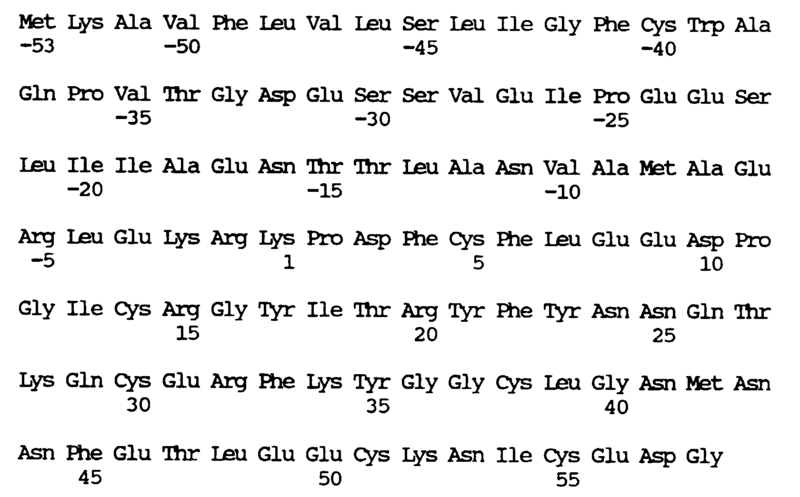 Examples of preferred variants of Kunitz-type domain II of TFPI are variants wherein X1 is Lys-Pro; or wherein X2 is an amino acid residue selected from the group consisting of Ala, Arg, Thr, Asp, Pro, Glu, Lys, Gln, Ser, Ile and Val, in particular wherein X2 is Thr or Pro; or wherein X3 is an amino acid residue selected from the group consisting of Pro, Thr, Leu, Arg, Val and Ile, in particular wherein X3 is Pro or Ile; or wherein X4 is an amino acid residue selected from the group consisting of Lys, Arg, Val, Thr, Ile, Leu, Phe, Gly, Ser, Met, Trp, Tyr, Gln, Asn and Ala, in particular wherein X4 is Lys, Val, Leu, Ile, Thr, Met, Gln or Arg; or wherein X5 is an amino acid residue selected from the group consisting of Ala, Gly, Thr, Arg, Phe, Gln and Asp, in particular wherein X5 is Ala, Thr, Asp or Gly; or wherein X6 is an amino acid residue selected from the group consisting of Arg, Ala, Lys, Leu, Gly, His, Ser, Asp, Gln, Glu, Val, Thr, Tyr, Phe, Asn, Ile and Met, in particular wherein X6 is Arg, Phe, Ala, Leu or Tyr; or wherein X7 is an amino acid residue selected from the group consisting of Ile, Met, Gln, Glu, Thr, Leu, Val and Phe, in particular wherein X7 is Ile; or wherein X8 is an amino acid residue selected from the group consisting of Ile, Thr, Leu, Asn, Lys, Ser, Gln, Glu, Arg, Pro and Phe, in particular wherein X8 is Ile or Thr; or wherein X9 is an amino acid residue selected from the group consisting of Arg, Ser, Ala, Gln, Lys and Leu, in particular wherein X9 is Arg; or wherein X10 is an amino acid residue selected from the group consisting of Gln, Pro, Phe, Ile Lys, Trp, Ala, Thr, Leu, Ser, Tyr, His, Asp, Met, Arg and Val, in particular wherein X10 is Val or Lys; or wherein X11 is an amino acid residue selected from the group consisting of Gly, Met, Gln, Glu, Leu, Arg, Lys, Pro and Asn, in particular wherein X11 is Arg or Leu; or wherein X12 is Ala or Gly; or wherein X13 is an amino acid residue selected from the group consisting of Lys, Asn and Asp, in particular wherein X13 is Lys or Asn; or wherein X14 is an amino acid residue selected from the group consisting of Val, Tyr, Asp, Glu, Thr, Gly, Leu, Ser, Ile, Gln, His, Asn, Pro, Phe, Met, Ala, Arg, Trp and Lys, in particular wherein X14 is Lys or Glu; or wherein X15 is Gly. In a preferred embodiment, X1 is Lys-Pro and X15 is Gly, while X2-X14 are as defined above. Variants of TFPI Kunitz-type domain II of the invention should preferably not contain a Met residue in the protease binding region (i.e. the amino acid residues represented by X3-X14). By analogy to α1-PI described above, a Met residue in any one of these positions would make the inhibitor sensitive to oxidative inactivation by oxygen metabolites produced by PMNs, and conversely, lack of a Met residue in these positions should render the inhibitor more stable in the presence of such oxygen metabolites. wherein X1-X15 are as indicated in claim 1, X16 is an amino acid residue selected from the group consisting of Gln, Gly, Ala, Ser, Val and Phe, in particular Gln or Ala, and X17 is an amino acid residue selected from the group consisting of Thr or Ala. In another aspect, the invention relates to a DNA construct encoding a human Kunitz-type inhibitor domain variant according to the invention. The DNA construct of the invention may be prepared synthetically by established standard methods, e.g. the phosphoamidite method described by S.L. Beaucage and M.H. Caruthers, Tetrahedron Letters 22, 1981, pp. 1859-1869, or the method described by Matthes et al., EMBO Journal 3, 1984, pp. 801-805. According to the phosphoamidite method, oligonucleotides are synthesized, e.g. in an automatic DNA synthesizer, purified, annealed, ligated and cloned in suitable vectors. Alternatively, it is possible to use genomic or cDNA coding for TFPI Kunitz-type domain II (e.g. obtained by screening a genomic or cDNA library for DNA coding for TFPI using synthetic oligonucleotide probes and isolating the DNA sequence coding for domain II therefrom). The DNA sequence is modified at one or more sites corresponding to the site(s) at which it is desired to introduce amino acid substitutions, e.g. by site-directed mutagenesis using synthetic oligonucleotides encoding the desired amino acid sequence for homologous recombination in accordance with well-known procedures. In a still further aspect, the invention relates to a recombinant expression vector which comprises a DNA construct of the invention. The recombinant expression vector may be any vector which may conveniently be subjected to recombinant DNA procedures, and the choice of vector will often depend on the host cell into which it is to be introduced. Thus, the vector may be an autonomously replicating vector, i.e. a vector which exists as an extrachromosomal entity, the replication of which is independent of chromosomal replication, e.g. a plasmid. Alternatively, the vector may be one which, when introduced into a host cell, is integrated into the host cell genome and replicated together with the chromosome(s) into which it has been integrated. In the vector, the DNA sequence encoding the TFPI Kunitz-type domain II variant of the invention should be operably connected to a suitable promoter sequence. The promoter may be any DNA sequence which shows transcriptional activity in the host cell of choice and may be derived from genes encoding proteins either homologous or heterologous to the host cell. Examples of suitable promoters for directing the transcription of the DNA encoding the TFPI Kunitz-type domain II variant of the invention in mammalian cells are the SV 40 promoter (Subramani et al., Mol. Cell Biol. 1, 1981, pp. 854-864), the MT-1 (metallothionein gene) promoter (Palmiter et al., Science 222, 1983, pp. 809-814) or the adenovirus 2 major late promoter. Suitable promoters for use in yeast host cells include promoters from yeast glycolytic genes (Hitzeman et al., J. Biol. Chem. 255, 1980, pp. 12073-12080; Alber and Kawasaki, J. Mol. Appl. Gen. 1, 1982, pp. 419-434) or alcohol dehydrogenase genes (Young et al., in Genetic Engineering of Microorganisms for Chemicals (Hollaender et al, eds. ), Plenum Press, New York, 1982), or the TPI1 (US 4, 599, 311) or ADH2-4c (Russell et al., Nature 304, 1983, pp. 652-654) promoters. Suitable promoters for use in filamentous fungus host cells are, for instance, the ADH3 promoter (McKnight et al., The EMBO J. 4, 1985, pp. 2093-2099) or the tpiA promoter. The DNA sequence encoding the TFPI Kunitz-type domain II variant of the invention may also be operably connected to a suitable terminator, such as the human growth hormone terminator (Palmiter et al., op. cit.) or (for fungal hosts) the TPI1 (Alber and Kawasaki, op. cit.) or ADH3 (McKnight et al., op. cit.) promoters. The vector may further comprise elements such as polyadenylation signals (e.g. from SV 40 or the adenovirus 5 Elb region), transcriptional enhancer sequences (e.g. the SV 40 enhancer) and translational enhancer sequences (e.g. the ones encoding adenovirus VA RNAs). The recombinant expression vector of the invention may further comprise a DNA sequence enabling the vector to replicate in the host cell in question. An examples of such a sequence (when the host cell is a mammalian cell) is the SV 40 origin of replication, or (when the host cell is a yeast cell) the yeast plasmid 2µ replication genes REP 1-3 and origin of replication. The vector may also comprise a selectable marker, e.g. a gene the product of which complements a defect in the host cell, such as the gene coding for dihydrofolate reductase (DHFR) or one which confers resistance to a drug, e.g. neomycin, hygromycin or methotrexate, or the Schizosaccharomyces pombe TPI gene (described by P.R. Russell, Gene 40, 1985, pp. 125-130. The procedures used to ligate the DNA sequences coding for the TFPI Kunitz-type domain II variant of the invention, the promoter and the terminator, respectively, and to insert them into suitable vectors containing the information necessary for replication, are well known to persons skilled in the art (cf., for instance, Sambrook et al., Molecular Cloning: A Laboratory Manual, Cold Spring Harbor, New York, 1989). The host cell into which the expression vector of the invention is introduced may be any cell which is capable of producing the TFPI Kunitz-type domain II variant of the invention and is preferably a eukaryotic cell, such as a mammalian, yeast or fungal cell. The yeast organism used as the host cell according to the invention may be any yeast organism which, on cultivation, produces large quantities of the TFPI Kunitz-type domain II variant of the invention. Examples of suitable yeast organisms are strains of the yeast species Saccharomyces cerevisiae, Saccharomyces kluyveri, Schizosaccharomyces pombe or Saccharomyces uvarum. The transformation of yeast cells may for instance be effected by protoplast formation followed by transformation in a manner known per se. Examples of suitable mammalian cell lines are the COS (ATCC CRL 1650), BHK (ATCC CRL 1632, ATCC CCL 10) or CHO (ATCC CCL 61) cell lines. Methods of transfecting mammalian cells and expressing DNA sequences introduced in the cells are described in e.g. Kaufman and Sharp, J. Mol. Biol. 159, 1982, pp. 601-621; Southern and Berg, J. Mol. Appl. Genet. 1, 1982, pp. 327-341; Loyter et al., Proc. Natl. Acad. Sci. USA 79, 1982, pp. 422-426; Wigler et al., Cell 14, 1978, p. 725; Corsaro and Pearson, Somatic Cell Genetics 7, 1981, p. 603, Graham and van der Eb, Virology 52, 1973, p. 456; and Neumann et al., EMBO J. 1, 1982, pp. 841-845. Alternatively, fungal cells may be used as host cells of the invention. Examples of suitable fungal cells are cells of filamentous fungi, e.g. Aspergillus spp. or Neurospora spp., in particular strains of Aspergillus oryzae or Aspergillus niger. The use of Aspergillus spp. for the expression of proteins is described in, e.g., EP 238 023. The present invention further relates to a method of producing a TFPI Kunitz-type domain II variant according to the invention, the method comprising culturing a cell as described above under conditions conducive to the expression of the variant and recovering the resulting variant from the culture. The medium used to cultivate the cells may be any conventional medium suitable for growing mammalian cells or fungal (including yeast) cells, depending on the choice of host cell. The variant will be secreted by the host cells to the growth medium and may be recovered therefrom by conventional procedures including separating the cells from the medium by centrifugation or filtration, precipitating the proteinaceous components of the supernatant or filtrate by means of a salt, e.g. ammonium sulfate, purification by a variety of chromatographic procedures, e.g. ion exchange chromatography or affinity chromatography, or the like. The present invention also relates to a pharmaceutical composition comprising a TFPI Kunitz-type domain II variant of the invention together with a pharmaceutically acceptable carrier or excipient. In the composition of the invention, the variant may be formulated by any of the established methods of formulating pharmaceutical compositions, e.g. as described in Remington's Pharmaceutical Sciences, 1985. The composition may typically be in a form suited for systemic injection or infusion and may, as such, be formulated with sterile water or an isotonic saline or glucose solution. The TFPI Kunitz-type domain II variant of the invention is therefore contemplated to be advantageous to use for the therapeutic applications suggested for native aprotinin or aprotinin analogues with other inhibitor profiles, in particular those which necessitate the use of large aprotinin doses. Therapeutic applications for which the use of the variant of the invention is indicated as a result of its ability to inhibit human serine proteases, e.g. trypsin, plasmin, kallikrein, elastase, cathepsin G and proteinase-3, include (but are not limited to) acute pancreatitis, inflammation, thrombocytopenia, preservation of platelet function, organ preservation, wound healing, shock (including shock lung) and conditions involving hyperfibrinolytic haemorrhage, emphysema, rheumatoid arthritis, adult respiratory distress syndrome, chronic inflammatory bowel disease and psoriasis, in other words diseases presumed to be caused by pathological proteolysis by elastase, cathepsin G and proteinase-3 released from triggered PMNs. Furthermore, the present invention relates to the use of TFPI Kunitz-type inhibitor domain II or a variant thereof as described above for the preparation of a medicament for the prevention or therapy of diseases or conditions associated with pathological proteolysis by proteases released from overstimulated PMNs. As indicated above, it may be an advantage of administer heparin concurrently with the TFPI Kunitz-type inhibitor domain II or variant. Apart from the pharmaceutical use indicated above, TFPI Kunitz-type domain II or a variant thereof as specified above may be used to isolate useful natural substances, e.g. proteases or receptors from human material, which bind directly or inderectly to TFPI Kunitz-type domain II, for instance by screening assays or by affinity chromatography. Standard DNA techniques were carried out as described (Sambrook, J., Fritsch, E.F., and Maniatis, T. (1989) Molecular Cloning: A Laboratory Manual, Cold Spring Harbor Laboratory Press, Cold Spring Harbor, NY). Synthetic oligonucleotides were prepared on an automatic DNA synthesizer (380B, Applied Biosystems) using phosphoramidite chemistry on a controlled pore glass support (Beaucage, S.L., and Caruthers, M.H., Tetrahedron Letters 22, (1981) 1859-1869). DNA sequence determinations were performed by the dideoxy chain-termination technique ( Sanger, F., Micklen, S., and Coulson, A.R., Proc. Natl. Acad. Sci. USA 74 (1977) 5463-5467). Polymerase chain reactions ( PCR) were performed on a DNA Thermal Cycler ( Perkin Elmer Cetus). Amino acid analysis was carried out after hydrolysis in 6M HCl at 110°C in vacuum-sealed tubes for 24 hours. Analysis was performed on a Beckman 121MB automatic amino acid analyzer modified for microbore operation. N-terminal amino acid sequence analysis was obtained by automated Edman degradation using an Applied Biosystems 470A gas-phase sequencer. Analysis by on-line reverse phase HPLC was performed for the detection and quantitation of the liberated PTH amino acids from each sequencer cycle. Molecular weight determination was obtained on a BIO-ION 20 plasma desorption mass spectrometer (PDMS) equipped with a flight tube of approximately 15 cm and operated in positive mode. Aliquots of 5µl were analyzed at an accelerating voltage set to 15 kV and ions were collected for 5 million fission events. The accuracy on assigned molecular ions is approximately 0.1% for well defined peaks, otherwise somewhat less. Example 1 Production of the second Kunitz domain of tissue factor pathway inhibitor, TFPI-2, from yeast strain KFN-1593. cDNA encoding full length TFPI was isolated from the human liver derived cell line HepG2 ( ATCC HB 8065) and inserted as a 0.9 kb BamHI - XbaI fragment into a mammalian expression vector, pKFN-1168, as described ( Pedersen, A.H., Nordfang, O., Norris, F., Wiberg, F.C., Christensen, P.M., Moeller, K.B., Meidahl-Pedersen, J., Beck, T.C., Norris, K., Hedner, U., and Kisiel, W. 1990, J. Biol. Chem. 265, 16786 - 16793). The DNA sequence of the insert is given in SEQ ID No. 7. TFPI-2 is encoded by nucleotides 365-538 as indicated. TFPI-2: 0.1 µg of the 0.9 kb BamHI-XbaI fragment from pKFN-1168 was used as a template in a PCR reaction containing 100 pmole each of the primers NOR-2526 ( GCTGAGAGATTGGAGAAGAGAAAGCCAGAT-TTCTGCTT) and NOR-2528 ( CTGGAATCTAGATTAACCATCTTCACAAATGTT). The 17 3'-terminal bases of NOR-2526 are identical to bases 365 to 381 in the TFPI-2 gene in SEQ ID No. 7, and the 21 5'-terminal bases are identical to bases 215 to 235 in the synthetic leader gene (see fig. 2) from pKFN-1000 described below. Primer NOR-2528 is complementary to bases 521 to 540 in SEQ ID No. 7 and has a 5' extension containing a translation stop codon followed by an XbaI site. The PCR reaction was performed in a 100µl volume using a commercial kit ( GeneAmp, Perkin Elmer Cetus) and the following cycle: 94° for 20 sec, 50° for 20 sec, and 72° for 30 sec. After 19 cycles a final cycle was performed in which the 72° step was maintained for 10 min. The PCR product, a 210 bp fragment, was isolated by electrophoresis on a 2 % agarose gel. Signal-leader: 0.1 µg of a 0.7 kb PvuII fragment from pKFN-1000 described below was used as a template in a PCR reaction containing 100 pmole each of the primers NOR-1478 ( GTAAAAC-GACGGCCAGT) and NOR-2523 ( TCTCTTCTCCAATCTCTCAGC). NOR-1478 is matching a sequence just upstream of the EcoRI site in SEQ ID No. 9. Primer NOR-2523 is complementary to the 17 3'-terminal bases of the synthetic leader gene of pKFN-1000, see SEQ ID No. 9. The PCR reaction was performed as described above, resulting in a 257 bp fragment. Plasmid pKFN-1000 is a derivative of plasmid pTZ19R (Mead, D.A., Szczesna-Skorupa, E. and Kemper, B., Prot. Engin. 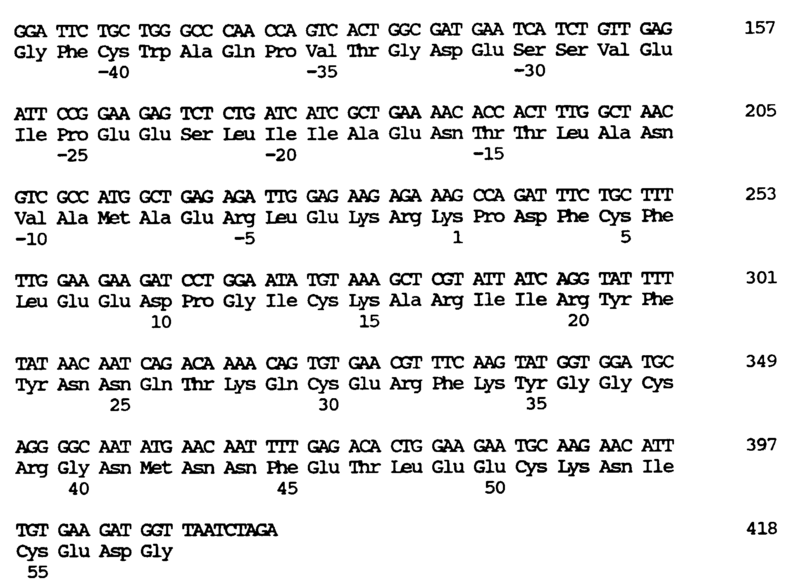 1 (1986) 67-74) containing DNA encoding a synthetic yeast signal-leader peptide. Plasmid pKFN-1000 is described in WO 90/10075. The DNA sequence of 235 bp downstream from the EcoRI site of pKFN-1000 and the encoded amino acid sequence of the synthetic yeast signal-leader is given in SEQ ID No. 9. Signal-leader-TFPI-2: Approx. 0.1 µg of each of the two PCR-fragments described above were mixed. A PCR reaction was performed using 100 pmole each of primers NOR-1478 and NOR-2528 and the following cycle: 94° for 1 min, 50° for 2 min, and 72° for 3 min. After 16 cycles a final cycle was performed in which the 72° step was maintained for 10 min. The resulting 442 bp fragment was purified by electrophoresis on a 1 % agarose gel and then digested with EcoRI and XbaI. The resulting 412 bp fragment was ligated to the 9.5 kb NcoI-XbaI fragment from pMT636 and the 1.4 kb NcoI-EcoRI fragment from pMT636. Plasmid pMT636 is described in International Patent application No. PCT/DK88/00138. pMT636 is an E. coli - S. cerevisiae shuttle vector containing the Schizosaccharomyces pombe TPI gene (POT) (Russell, P.R., Gene 40 (1985) 125-130), the S. cerevisiae triosephosphate isomerase promoter and terminator, TPIp and TPIT (Alber, T., and Kawasaki, G. J. Mol. Appl. Gen. 1 (1982), 419-434). The ligation mixture was used to transform a competent E. coli strain (r-, m+) selecting for ampicillin resistance. DNA sequencing showed that plasmids from the resulting colonies contained the correct DNA sequence for TFPI-2 correctly fused to the synthetic yeast signal-leader gene. One plasmid pKFN-1605 was selected for further use. The construction of plasmid pKFN-1605 is illustrated in Fig. 1. The DNA sequence of the 412 bp EcoRI-XbaI fragment from pKFN-1605 is shown in SEQ ID No. 11. Yeast transformation: S. cerevisiae strain MT663 (E2-7B XE11-36 a/α, Δtpi/Δtpi, pep 4-3/pep 4-3) was grown on YPGaL (1% Bacto yeast extract, 2% Bacto peptone, 2% galactose, 1% lactate) to an O.D. at 600 nm of 0.6. 100 ml of culture was harvested by centrifugation, washed with 10 ml of water, recentrifugated and resuspended in 10 ml of a solution containing 1.2 M sorbitol, 25 mM Na2EDTA pH = 8.0 and 6.7 mg/ml dithiotreitol. The suspension was incubated at 30°C for 15 minutes, centrifuged and the cells resuspended in 10 ml of a solution containing 1.2 M sorbitol, 10 mM Na2EDTA, 0.1 M sodium citrate, pH = 5.8, and 2 mg Novozym® 234. The suspension was incubated at 30°C for 30 minutes, the cells collected by centrifugation, washed in 10 ml of 1.2 M sorbitol and 10 ml of CAS (1.2 M sorbitol,10 mM CaCl2, 10 mM Tris HCl (Tris = Tris(hydroxymethyl)aminomethane) pH = 7.5) and resuspended in 2 ml of CAS. For transformation, 0.1 ml of CAS-resuspended cells were mixed with approx. 1 µg of plasmid pKFN-1605 and left at room temperature for 15 minutes. 1 ml of (20% polyethylene glycol 4000, 20 mM CaCl2, 10 mM CaCl2, 10 mM Tris HCl, pH = 7.5) was added and the mixture left for a further 30 minutes at room temperature. The mixture was centrifuged and the pellet resuspended in 0.1 ml of SOS (1.2 M sorbitol, 33% v/v YPD, 6.7 mM CaCl2, 14 µg/ml leucine) and incubated at 30°C for 2 hours. The suspension was then centrifuged and the pellet resuspended in 0.5 ml of 1.2 M sorbitol. Then, 6 ml of top agar (the SC medium of Sherman et al., (Methods in Yeast Genetics, Cold Spring Harbor Laboratory (1982)) containing 1.2 M sorbitol plus 2.5% agar) at 52°C was added and the suspension poured on top of plates containing the same agar-solidified, sorbitol containing medium. Transformant colonies were picked after 3 days at 30°C, reisolated and used to start liquid cultures. One such transformant KFN-1593 was selected for further characterization. Fermentation: Yeast strain KFN-1593 was grown on YPD medium ( 1% yeast extract, 2% peptone ( from Difco Laboratories), and 3% glucose). A 1 liter culture of the strain was shaken at 30°C to an optical density at 650 nm of 24. After centrifugation the supernatant was isolated. Purification: The yeast supernatant (1000 ml) adjusted to pH 3.0 with phosphoric acid was applied on a column of S-Sepharose Fast Flow (Pharmacia, 2.6 x 3.6 cm) equilibrated with 25 mM sodium dihydrogen phosphate, pH = 3.5. After wash with equilibration buffer, TFPI-2 assayed as trypsin inhibitory activity was eluted with buffer containing 1M sodium chloride ( 40 ml). Desalting was obtained on a Sephadex G-25 column ( Pharmacia, 2.6 x 34 cm) equilibrated and eluted with ammonium hydrogen carbonate, pH = 7.5. Further purification was performed on a Mono S column (Pharmacia, 0.5 x 5 cm) by gradient elution over 23 min at 1 ml/min from 0 - 0.43 M sodium chloride in 25 mM sodium dihydrogen phosphate, 10% w/v acetonitrile, pH = 3.5. N-glycosylated TFPI-2 and unglycosylated TFPI-2 eluted at 0.20 M an 0.26 M sodium chloride, respectively. Final purification of unglycosylated TFPI-2 was performed by reverse phase HPLC on a C18 column (Novo Nordisk A/S, 0.4 x 25 cm) by gradient elution over 30 min at 1 ml/min from 0 - 50% acetonitrile, 0.1% trifluoroacetic acid. TFPI-2 eluted at 40% acetonitrile. The purified product was lyophilized and redissolved in water to a concentration of approx. 200 nM. Aliquot samples of this solution were analysed for amino acid composition (table 1), amino acid sequence, molecular weight ( PDMS, found: MW 6840.8, calc. : 6840.6) and protease inhibitory activities. Example 2 Production of [R15K, G16A, Y17R, T19I]-TFPI-2 from yeast strain KFN-1811. 0.1 µg of the 1.3 kb SphI-BamHI fragment encoding TFPI-2 from plasmid pKFN-1605 was used as a template in two PCR reactions. 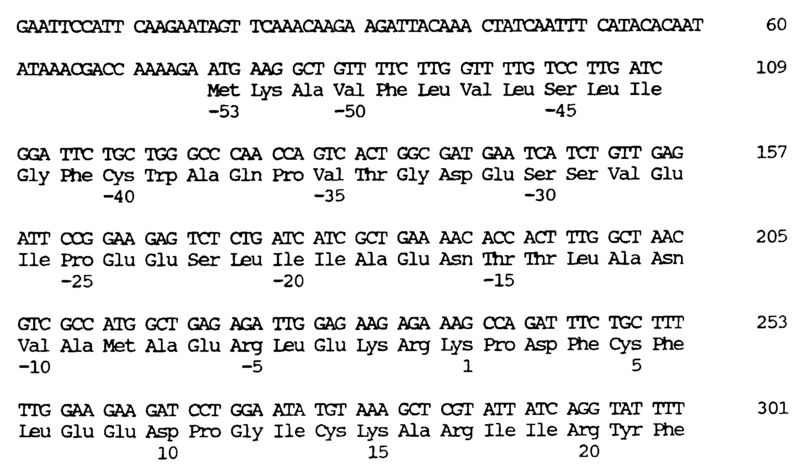 In the first PCR reaction 100 pmole each of the primers NOR-2022 ( GGAGTTTAGTGAACTTGC) and M-460 ( GTTATAAAAATACCTGATAATACGAGCTT-TACATATTCCAGGATC) was used. 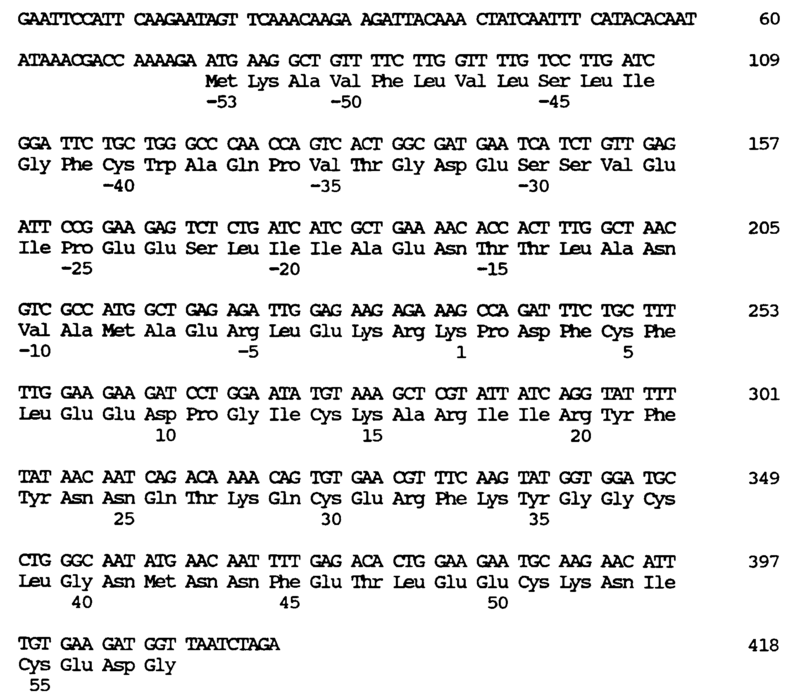 In the second PCR reaction 100 pmole each of the primers NOR-1495 (TAAGTGGCTCAGAATGA) and M-459 (GAT-CCTGGAATATGTAAAGCTCGTATTATCAGGTATTTTTATAAC) was used. NOR-2022 primes at a position 94 bp downstream of the SphI site. M-460 is complementary to the TFPI-2 DNA-sequence position 263-307, SEQ ID No. 11, except for six mismatches. NOR-1495 primes at a position 561 bp upstream form the BamHI site. M-459 is complementary to M-460. The PCR reaction was performed in a 100µl volume using a commercial kit ( GeneAmp, Perkin Elmer Cetus) and the following cycle: 95° for 1 min, 50° for 1 min, and 72° for 2 min. After 24 cycles a final cycle was performed in which the 72° step was maintained for 10 min. The PCR products, a 444 bp fragment from the first PCR and a 285 bp fragment from the second, were isolated by electrophoresis on a 2 % agarose gel. Approx. 0.1 µg of each of the two PCR-fragments described above were mixed. A PCR reaction was performed using 100 pmole each of primers NOR-2022 and NOR-1495 and the following cycle: 95° for 1 min, 50° for 2 min, and 72° for 3 min. After 22 cycles a final cycle was performed in which the 72° step was maintained for 10 min. The resulting 687 bp fragment was purified by electrophoresis on a 1 % agarose gel and then digested with EcoRI and XbaI. The resulting 412 bp fragment was ligated to the 9.5 kb NcoI-XbaI fragment from pMT636 and the 1.4 kb NcoI-EcoRI fragment from pMT636. Plasmid pMT636 is described in example 1. The ligation mixture was used to transform a competent E. coli strain r-, m+) selecting for ampicillin resistance. DNA sequencing showed that plasmids from the resulting colonies contained the correct DNA sequence for [R15K, G16A, Y17R, T19I]-TFPI-2 fused to the synthetic yeast signal-leader gene. One plasmid pKFN-1798 was selected for further use. The DNA sequence of the 412 bp EcoRI-XbaI fragment from pKFN-1798 is shown in SEQ ID No. 13. Plasmid pKFN-1798 was transformed in yeast strain MT663 as described in example 1 resulting in yeast strain KFN-1811. Culturing of the transformed strain KFN-1811 in YPD-medium, analysis for [R15K, G16A, Y17R, T19I]-TFPI-2 in the supernatant, and purification was performed as described in example 1. KFN 1593 was purified from yeast culture medium as described in example 1. The concentration of KFN 1593 was determined using 1% E280 nm = 8.3 and MW = 6500. Porcine trypsin was from Novo Nordisk (Bagsværd, Denmark), bovine chymotrypsin (TLCK treated) and porcine pancreatic kallikrein was from Sigma Chemical Co (St. Louis, MO, USA), human plasmin and human plasma kallikrein was from Kabi (Stockholm, Sweden). Human neutrophil elastase and cathepsin G was purified from extracts of PMNs according to the method described by Baugh and Travis (Biochemistry 15 (1976) 836-843). Peptidyl nitroanilide substrates, S2251, S2586, S2266, S2302 were from Kabi (Stockholm, Sweden). M4765 and S7388 was from Sigma Chemical Co (St. Louis, MO, USA) and FXa-1 was from NycoMed (Oslo, Norway). Serine proteinases were incubated with various concentrations of KFN 1593 for 30 min. Substrate was then added and residual proteinase activity was measured at 405 nm. The results are shown in Fig. 2 and Fig. 3. Example 4 Production of [R15K, G16A, Y17R, T19I, L39R]-TFPI-2 from yeast strain KFN-1867. 0.1 µg of the 1.3 kb SphI-BamHI fragment encoding [R15K, G16A, Y17R, T19I]-TFPI-2 from plasmid pKFN-1798 was used as a template in two PCR reactions. In the first PCR reaction 100 pmole each of the primers NOR-2022 ( GGAGTTTAGTGAACTTGC) and M-462 ( CCAG-TGTCTCAAAATTGTTCATATTGCCCCTGCATCCACC) was used. In the second PCR reaction 100 pmole each of the primers NOR-1495 (TAAGTGGCTCAGAA-TGA) and M-461 (GGTGGATGCAGGGGCAATATGAACAATTTTGAGACACTGG) was used. NOR-2022 primes at a position 94 bp downstream of the SphI site. M-462 is complementary to the TFPI-2 DNA-sequence position 341-380, SEQ ID No. 11, except for two mismatches. NOR-1495 primes at a position 561 bp upstream from the BamHI site. M-461 is complementary to M-462. The PCR reaction was performed in a 100µl volume using a commercial kit ( GeneAmp, Perkin Elmer Cetus) and the following cycle: 95° for 1 min, 50° for 1 min, and 72° for 2 min. After 24 cycles a final cycle was performed in which the 72° step was maintained for 10 min. The PCR products, a 518 bp fragment from the first PCR and a 209 bp fragment from the second, were isolated by electrophoresis on a 2 % agarose gel. The ligation mixture was used to transform a competent E. coli strain r-, m+) selecting for ampicillin resistance. DNA sequencing showed that plasmids from the resulting colonies contained the correct DNA sequence for [R15K, G16A, Y17R, T19I, L39R]-TFPI-2 fused to the synthetic yeast signal-leader gene. One plasmid pKFN-1861 was selected for further use. The DNA sequence of the 412 bp EcoRI-XbaI fragment from pKFN-1861 is shown in SEQ ID No. 15. Plasmid pKFN-1861 was transformed in yeast strain MT663 as described in example 1 resulting in yeast strain KFN-1867. Culturing of the transformed strain KFN-1867 in YPD-medium, analysis for [R15K, G16A, Y17R, T19I, L39R]-TFPI-2 in the supernatant, and purification was performed as described in example 1. Example 5 Production of [R15K, G16A, Y17R, T19I, L39R, E46K]-TFPI-2 from yeast strain KFN-1868. 0.1 µg of the 1.3 kb SphI-BamHI fragment encoding [R15K, G16A, Y17R, T19I]-TFPI-2 from plasmid pKFN-1798 was used as a template in two PCR reactions. In the first PCR reaction 100 pmole each of the primers NOR-2022 ( GGAGTTTAGTGAACTTGC) and M-464 ( CCAG-TGTCTTAAAATTGTTCATATTGCCCCTGCATCCACC) was used. 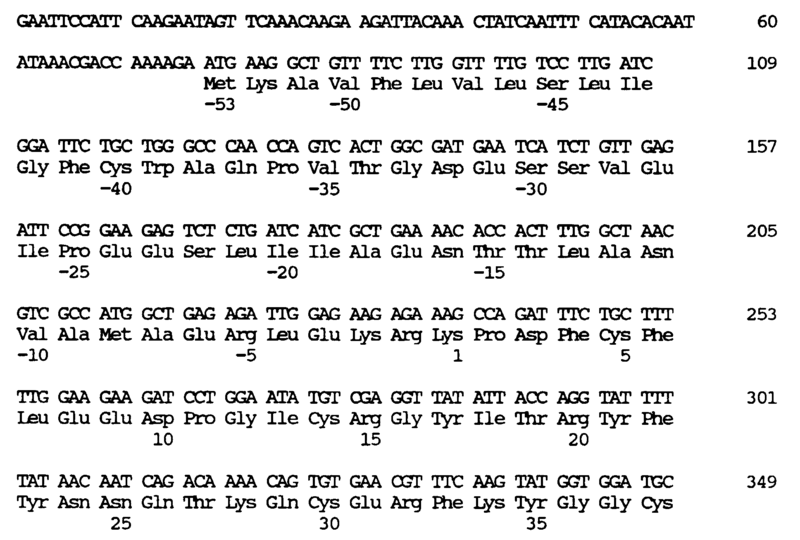 In the second PCR reaction 100 pmole each of the primers NOR-1495 (TAAGTGGCTCAGAA-TGA) and M-463 (GGTGGATGCAGGGGCAATATGAACAATTTTAAGACACTGG) was used. NOR-2022 primes at a position 94 bp downstream of the SphI site. M-464 is complementary to the TFPI-2 DNA-sequence position 341-380, SEQ ID No. 11, except for three mismatches. NOR-1495 primes at a position 561 bp upstream from the BamHI site. M-463 is complementary to M-464. The ligation mixture was used to transform a competent E. coli strain r-, m+) selecting for ampicillin resistance. DNA sequencing showed that plasmids from the resulting colonies contained the correct DNA sequence for [R15K, G16A, Y17R, T19I, L39R, E46K]-TFPI-2 fused to the synthetic yeast signal-leader gene. One plasmid pKFN-1862 was selected for further use. The DNA sequence of the 412 bp EcoRI-XbaI fragment from pKFN-1862 is shown in SEQ ID No. 17. Plasmid pKFN-1862 was transformed in yeast strain MT663 as described in example 1 resulting in yeast strain KFN-1868. Culturing of the transformed strain KFN-1868 in YPD-medium, analysis for [R15K, G16A, Y17R, T19I, L39R, E46K]-TFPI-2 in the supernatant, and purification was performed as described in example 1. Example 6 Multiple mutation of TFPI-2 in Position 15 and 16. 0.1 µg of the 1.3 kb SphI-BamHI fragment encoding TFPI-2 from plasmid pKFN-1605 was used as a template in two PCR reactions. In the first PCR reaction 100 pmole each of the primers NOR-2022 ( GGAGTTTAGTGAACTTGC) andM-749 ( AATACCTGGTAATATAA(C/G)C(C/G)A-(A/C)ACATATTCCAGGATC) was used. 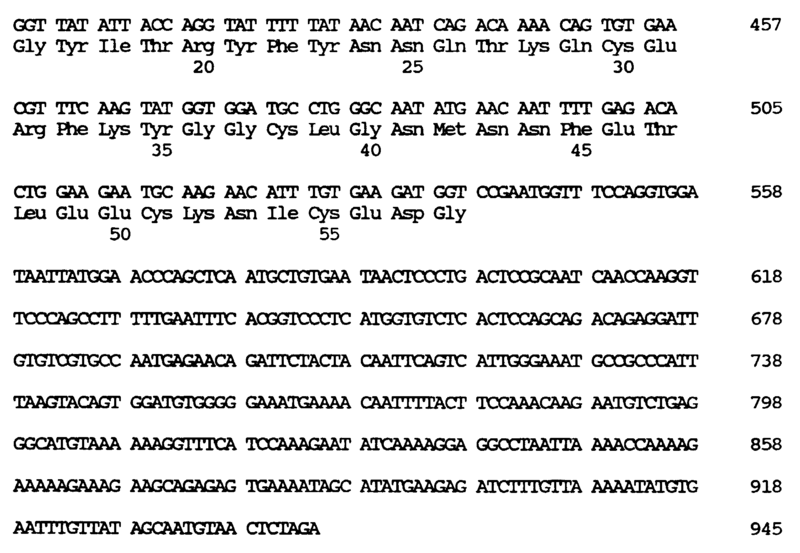 In the second PCR reaction 100 pmole each of the primers NOR-1495 (TAAGTGGCTCAGAATGA) and M-750 (GATCCTGGAATATGT(T/G)T(C/G)G(C/G)TTATATTACCAGGTATT) was used. NOR-2022 primes at a position 94 bp downstream of the SphI site. M-749 is complementary to the TFPI-2 DNA-sequence position 263-299, SEQ ID No. 11, except for four mismatches. NOR-1495 primes at a position 561 bp upstream from the BamHI site. M-750 is complementary to M-749. The PCR reaction was performed in a 100µl volume using a commercial kit ( GeneAmp, Perkin Elmer Cetus) and the following cycle: 95° for 1 min, 50° for 1 min, and 72° for 2 min. After 24 cycles a final cycle was performed in which the 72° step was maintained for 10 min. The PCR products, a 439 bp fragment from the first PCR and a 285 bp fragment from the second, were isolated by electrophoresis on a 2 % agarose gel. The resulting 687 bp fragment was purified by electrophoresis on a 1 % agarose gel and then digested with EcoRI and XbaI. The resulting 412 bp fragment was ligated to the 2.8 kb EcoRI-XbaI fragment from plasmid pTZ19R ( Mead, D. A., Szczesna-Skopura, E., and Kemper, B. Prot. Engin. 1 (1986) 67-74). The 412 bp EcoRI-XbaI fragments from these plasmids were used for the construction of the expression plasmids as described in example 1. Culturing of the transformed yeast strains in YPD-medium, analysis for TFPI-2 analogs in the supernatant, and purification was performed as described in example 1. The three TFPI (domain II) variants were purified from yeast culture medium. Their concentrations were determined from the absorbance at 214 nm using BPTI as a standard. The final concentration was determined by titration with trypsin. Porcine trypsin and human recombinant proteins, factor VIIa, activated protein C (ACP), and tPA were obtained from Novo Nordisk A/S (Bagsvaerd, Denmark), so was human thrombin. Bovine chymotrypsin and glandular kallikrein were obtained from Sigma Chemical Co. (St. Louis, MO, USA). Truncated human recombinant tissue factor was obtained from Corvas (San Diego, CA, USA). 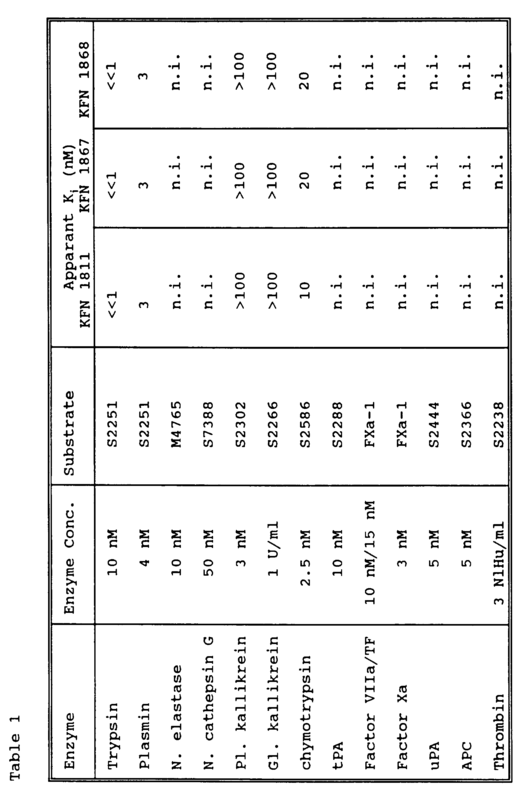 Human neutrophil cathepsin G was purified from extracts of PMNs according to the method described by Baugh and Travis (Biochemistry 15 (1976) 836-843). Human plasmin was from Kabi (Stockholm, Sweden), uPA was from Serono (Milan, Italy), human factor Xa was a gift from Dr. W. Kisiel (Albuquerque, NM, USA), and human plasma kallikrein was a gift from Dr. I Schousboe (Copenhagen, Denmark). Peptidyl nitroanilide substrates, S2251, S2302, S2266, S2586, S2288, S2444, S2366, and S2238 were from Kabi (Stockholm, Sweden). S7388 and M4765 were from from Sigma Chemical Co. (St. Louis, MO, USA) and FXa-1 was from Nycomed (Oslo, Norway). Serine proteinases were incubated with various concentrations of Kunitz Domain variant for 30 min. Substrate (0.6 mM) was then added and residual proteinase activity was measured at 405 nm. The results are shown in Table 1. The three variants are strong specific plasmin inhibitors without significant inhibition of other proteinases from plasma tested. The four variants were purified from yeast culture medium. Their concentrations were determined from the absorbance at 214 nm using BTPI as a standard. Porcine trypsin was obtained from Novo Nordisk A/S (Bagsvaerd, Denmark, bovine chymotrypsin (TLCK treated) was obtained from Sigma Chemical Co. (St. Louis, MO, USA). Truncated human recombinant tissue factor was obtained from Corvas (San Diego, CA, USA). Human plasmin was from Kabi (Stockholm, Sweden). Human neutrophil cathepsin G and elastase were purified from extracts of PMNs according to the method described by Baugh and Travis (Biochemistry 15 (1976) 836-843). Peptidyl nitroanilide substrates, S2251, S2586 were from Kabi (Stockholm, Sweden). S7388 and M4765 were from Sigma Chemical Co. (St. Louis, MO, USA). Serine proteinases were incubated with various concentrations of the variants for 30 min. Substrate (0.6 nM) was then added and residual proteinase activity was measured at 405 nm. The results are shown in Table 2. The four TFPI Kunitz domain II variants (KFN 1893, 1897, 1898, 1928) were found to be strong inhibitors of neutrophil elastase. wherein X1 represents H or 1-5 naturally occurring amino acid residues except Cys, X2-X14 each independently represents a naturally occurring amino acid residue, and X15 represents OH or 1-5 naturally occurring amino acid residues except Cys, with the proviso that at least one of the amino acid residues X1-X15 is different from the corresponding amino acid residue of the native sequence, and with the further proviso that X4 is not Leu. A variant according to claim 1, wherein X1 is Lys-Pro. A variant according to claim 1, wherein X2 is an amino acid residue selected from the group consisting of Ala, Arg, Thr, Asp, Pro, Glu, Lys, Gln, Ser, Ile and Val. A variant according to claim 3, wherein X2 is Thr or Pro. A variant according to claim 1, wherein X3 is an amino acid residue selected from the group consisting of Pro, Thr, Leu, Arg, Val and lie. A variant according to claim 5, wherein X3 is Pro or Ile. A variant according to claim 1, wherein X4 is an amino acid residue selected from the group consisting of Lys, Arg, Val, Thr, Ile, Phe, Gly, Ser, Met, Trp, Tyr, Gln, Asn and Ala.
A variant according to claim 7, wherein X4 is Lys, Val, Ile, Thr, Met, Gln or Arg. A variant according to claim 1, wherein X5 is an amino acid residue selected from the group consisting of Ala, Gly, Thr, Arg, Phe, Gln and Asp. A variant according to claim 9, wherein X5 is Ala, Thr, Asp or Gly. 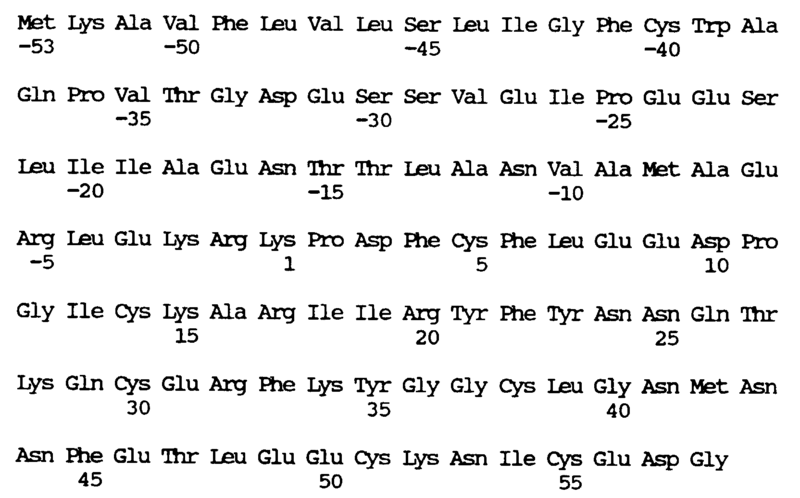 A variant according to claim 1, wherein X6 is an amino acid residue selected from the group consisting of Arg, Ala, Lys, Leu, Gly, His, Ser, Asp, Gln, Glu, Val, Thr, Tyr, Phe, Asn, Ile and Met. A variant according to claim 11, wherein X6 is Arg, Phe, Ala, Leu or Tyr. A variant according to claim 1, wherein X7 is an amino acid residue selected from the group consisting of Ile, Met, Gln, Glu, Thr, Leu, Val and Phe. A variant according to claim 13, wherein X7 is Ile. A variant according to claim 1, wherein X8 is an amino acid residue selected from the group consisting of Ile, Thr, Leu, Asn, Lys, Ser, Gln, Glu, Arg, Pro and Phe. A variant according to claim 15, wherein X8 is Ile or Thr. A variant according to claim 1, wherein X9 is an amino acid residue selected from the group consisting of Arg, Ser, Ala, Gln, Lys and Leu. A variant according to claim 17, wherein X9 is Arg. A variant according to claim 1, wherein X10 is an amino acid residue selected from the group consisting of Gln, Pro, Phe, Ile Lys, Trp, Ala, Thr, Leu, Ser, Tyr, His, Asp, Met, Arg and Val. A variant according to claim 19, wherein X10 is Val or Lys. A variant according to claim 1, wherein X1 is an amino acid residue selected from the group consisting of Gly, Met, Gln, Glu, Leu, Arg, Lys, Pro and Asn. A variant according to claim 21, wherein X11 is Arg or Leu. A variant according to claim 1, wherein X12 is Ala or Gly. A variant according to claim 1, wherein X13 is an amino acid residue selected from the group consisting of Lys, Asn and Asp. A variant according to claim 24, wherein X13 is Lys or Asn. 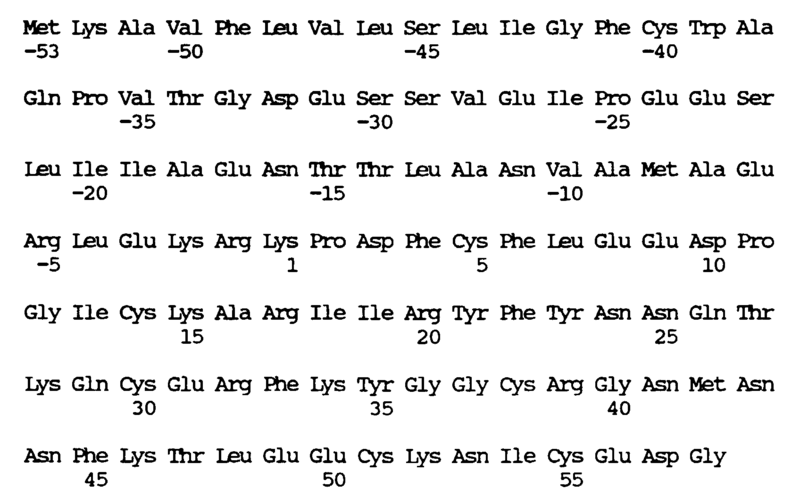 A variant according to claim 1, wherein X14 is an amino acid residue selected from the group consisting of Val, Tyr, Asp, Glu, Thr, Gly, Leu, Ser, Ile, Gln, His, Asn, Pro, Phe, Met, Ala, Arg, Trp and Lys. A variant according to claim 26, wherein X14 is Lys or Glu. A variant according to claim 1, wherein X15 is Gly. A variant according to claim 1, wherein X1 is Lys-Pro and X15 is Gly. A DNA construct comprising a DNA sequence encoding a human Kunitz-type protease inhibitor variant according to any of claims 1-34. A recombinant expression vector comprising a DNA construct according to claim 35. A cell containing a DNA construct according to claim 35 or an expression vector according to claim 36. A method of producing a human Kunitz-type protease inhibitor variant according to any of claims 1-34, the method comprising culturing a cell according to claim 37 under conditions conducive to the expression of the protein, and recovering the resulting protein from the culture. A pharmaceutical composition comprising a human Kunitz-type protease inhibitor variant according to any of claims 1-34 and a pharmaceutically acceptable carrier or excipient. A composition according to claim 39 which further comprises heparin. Use of human Kunitz-type protease inhibitor domain II of TFPI or a variant thereof according to any of claims 1-34 for the preparation of a medicament for the prevention or treatment of diseases or conditions associated with pathological proteolysis. Friedrich et al. 1993 A Kazal-type inhibitor with thrombin specificity from Rhodnius prolixus. Scott et al. 1986 Alpha-1-antitrypsin-Pittsburgh. A potent inhibitor of human plasma factor XIa, kallikrein, and factor XIIf.